It’s no surprise to anyone that the games industry is growing at an incredible rate. The industry is worth billions and is bigger than any other form of entertainment on the planet. Everyone wants a piece of that pie, and everyone wants to create games that people love to play (and buy). I’m a tiny part of this enormous machine. I spend the majority of my time creating content that goes into video games which people are going to buy and play. Despite games playing a huge part in my life, I don’t have time to play every game that comes out. That seems a little obvious, so let me narrow it down further. I don’t have time to play every game I want to play that comes out. 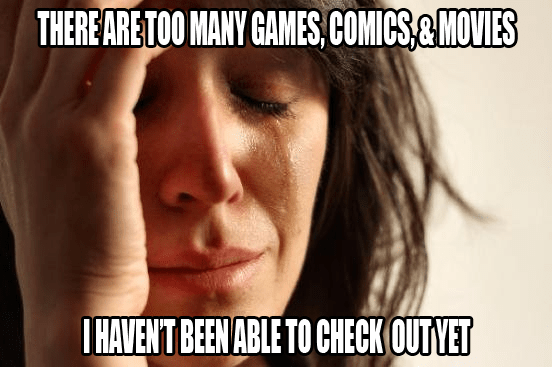 I can narrow it down more; I don’t have time to play all the games I’ve already purchased and that sit on my shelf at home. The over-saturation of the games market isn’t an industry problem, competition breeds innovation, but it is a personal problem I have. I love games and I want to experience what other hard working developers have created, but there just isn’t the time. 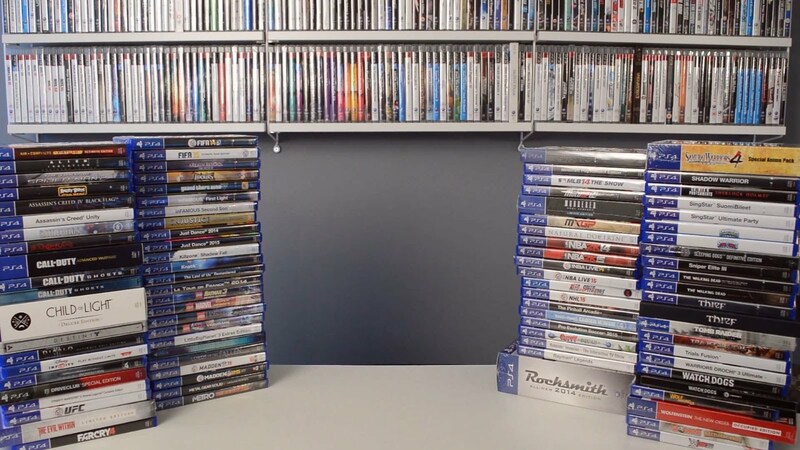 As I unpacked all of my possessions in my new apartment at the start of January, I marveled at the number of games I owned that I hadn’t completed. Now don’t get me wrong, I’m not as bad as a lot of people I know, but I still feel bad that I had titles I’d only played for a couple of hours. This feeling was intensified when I looked at the number of books I owned and hadn’t read, and the comics, and the TV shows I had queued on Netflix. I realized that I had a lot of stuff to catch up on and limited time to do it. I started to stress about it. What did I prioritize? What should I start with? Should I enjoy a lot of smaller things or get stuck into something that’s going to take dozens of hours to finish? All these questions were rattling around in my brain until I realized that this problem was never ever going to go away. New stuff was coming out fast. I looked at my wishlist and shuddered. I needed to change something about the way I consumed media before I drove myself insane. After some thinking I decided that the best way to deal with the problem was to start at the beginning of the issue; the purchasing of media to consume. I took a long look at all the things I had yet to finish and decided I need to limit my future purchases to a manageable amount. This means I won’t get to buy everything I want to experience as soon as it launches. With this process I settled on a system that was inspired by my audible subscription. If you don’t know what Audible is, it’s an audio book site owned by Amazon. They sell audio-books which you can buy normally, but they also do a subscription where you pay a flat amount each month and in return you get a number of credits to use on purchases. I really liked this system as it kept my audio-book spending in check and gave me enough time to finish one before another was available to me. upon buying one game per month. I took this model and applied it to my video game purchasing. What this means is that for every month of 2017 I will only buy one new video game. I’ve not been doing this long, but I’m already seeing real positive improvements to my gaming habits, and the use of my free time in general. With this system I am completing games more often. I look forward to my monthly purchase and get excited about a new game to play. January’s game was Resident Evil which I loved. It didn’t take me too long to complete, but that meant I had more time to revisit old titles in my library, and also to enjoy other forms of entertainment. February’s game is Horizon: Zero Dawn, which isn’t out yet, so I’ve been catching up on a little TV, reading more books, and also started my miniature painting again. I’m also saving money, which right now is really important to me as I’ve got a lot of life goals to achieve this year that require me to save where I can. Of course there are some downsides to this system. I often have to make some tough decisions about which game I want to play. I am finding though that if I force myself to pick the one game I really want each month, I come to realize that perhaps I didn’t want the other ones as much as I initially thought. What I’ve been doing with games I decide not to buy right away is put them in a wish list on Amazon. Eventually there will be a month where no games come out that I want, (June, July, August I’m looking at you) so when that happens I’ll take a peek into my list and find something that I wanted that I didn’t get. Putting limits on my own spending and gaming habits might seem like an extreme measure, but when you are into as many different things as I am I feel like it’s an important discipline to have. Anyway there’s a little glimpse into the life of a child trapped in an adult’s body/life. Next week I’ll have another campaign diary for you. Take care.